Anyway, last month Netflix released an Original Series called Unbreakable Kimmy. I received the email from Netflix letting me know that this show would be right down my alley but I ignored it. I'm not sure why because they totally got me with Iliza Shlesinger's Freezing Hot! back in January. (See post here.) Yesterday while eating my breakfast I searched Netflix for something quick to watch. Unbreakable Kimmy popped up and I hit play. Thank goodness for that! 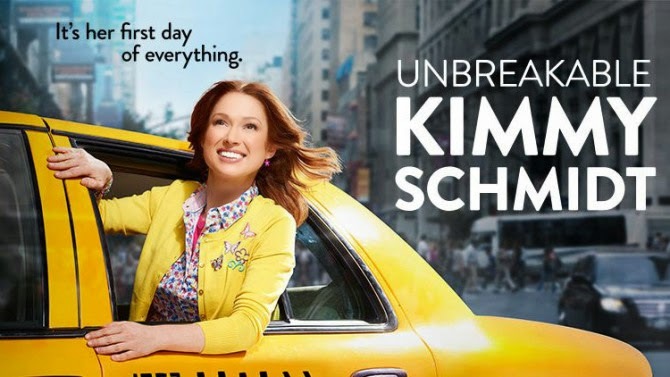 Unbreakable Kimmy is about 29-year old Kimmy Schmidt adjusting to her new life in NYC after being rescued from a cult that had her and three other ladies (the Mole Women) in a bunker for 15 years because their cult leader told them the earth had been destroyed by an apocalypse. After being rescued, a witness is interviewed and the intro song is born. 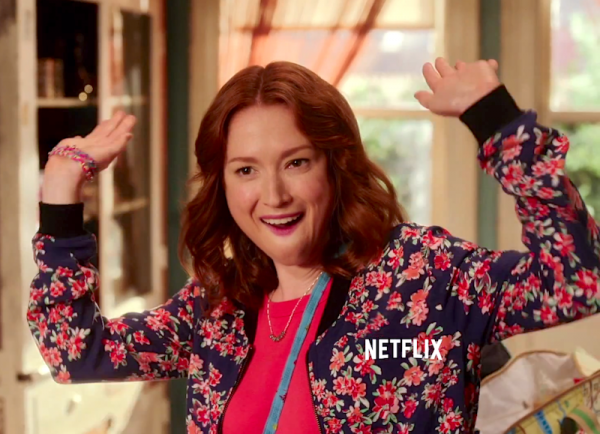 The show is written by Tina Fey & Robert Carlock, starring Ellie Kemper (The Office, Bridesmaids) which is amazingly funny. She's basically new to everything that you and I take for granted everyday like eating candy for dinner haha! I mean, she was locked up in there when she was 14. She calls an iPhone a Macintosh for goodness sake haha! She finds a roomie and a job by accident and it all gets funnier from there. The positivity that Kimmy projects is incredibly contagious and so good to see. I'm not finished with the show yet but I'm definitely enjoying it & the best part is that it will be back for Season 2. Folks you might be familiar with that are on the show (Cast and recurring) --> Carol Kane (Gotham), Tituss Burgess (30 Rock), Jane Krakowski (30 Rock), Martin Short (I don’t really have to go there, do I? ), Richard Kind (Mad About You), Adam Campbell (Date Movie), Kiernan Brennan Shipka (Mad Men), Dean Norris (Breaking Bad), and Jon Hamm (Mad Men). I'm trying to take it easy on the binge watching because it hurts so much when its over LOL!